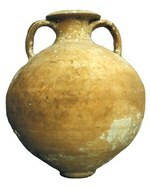 This amphora has a ringed base that is either flat or concave. It has a short neck and everted rim made by turning the clay back on itself. The upper face of the wide rim is flat or slightly everted and is decorated with two or three very characteristic deep grooves. On the body, under the lower attachment of the handles, there is a deep wavy decoration, traced by a comb in an uncertain fashion.The lower attachment of the handles is sometimes decorated with designs of lozenges/buttons. Three versions have been defined (Laubenheimer & Lequoy, 1992). Maximum height: Large size 50cm, middle size 36cm, small size 28cm. Maximum width: large size 46cm ; middle size 33.6cm, small size 25.3cm. Maximum rim diameter: Large size 18.1cm, middle size 12.1cm, small size 8.2cm. First to third centuries AD. Three centres of production are known, at Chartres (Eur-et-Loir), La Bosse close to Le Mans (Sarthe) and at La Boissière-Ecole (Yvelines); two other groups of production have been identified at Vatteville-la-Rue and at Caen by physical and chemical analysis but without locating the exact source (Misone et alii, 1998). Widespread distribution in Normandy with exports to the Channel Islands, the south-west of England and to Scotland. Probably wine although there is no epigraphic evidence to confirm this. Capacity: large version 40.6 litres, middle size 14.5 litres, small model 6.4litres.